Floyd has a new celebration to kick off the first weekend of every month and it’s called "First Friday" at the galleries under the Winter Sun. It showcases new artists and musicians every month and is becoming a popular social event for local citizens as well as a visitor attraction. This month the featured artists were Karen Limke (photography), and Andrea Marshall (jewelry). 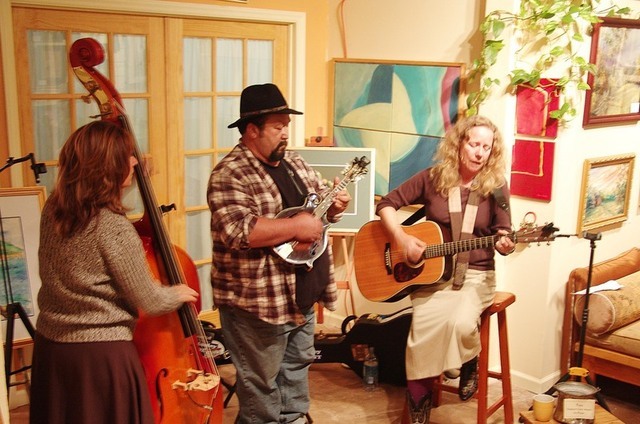 Andrea also performed with her band, the Ironic Dixie Trio. 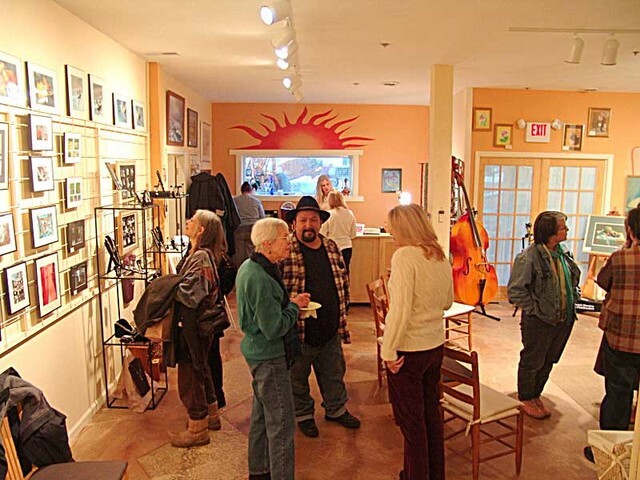 First Friday is hosted by the Art Under the Sun Gallery but the celebration was joined by all of the galleries and shops in the Winter Sun building. 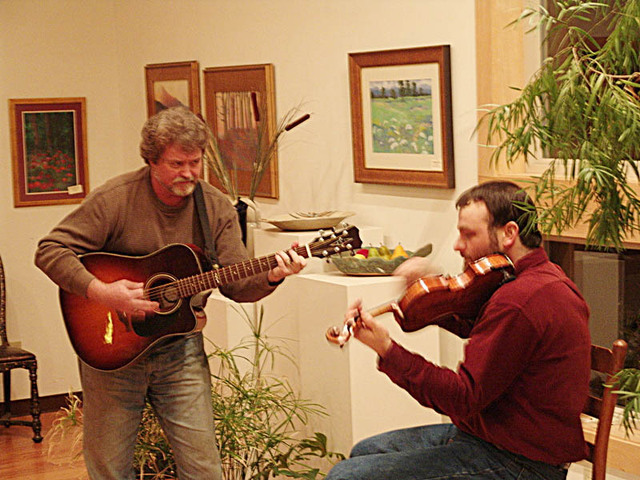 There was live music and refreshments and it was an occasion for hard working Floyd County residents to congregate, see the best in local art and catch up on local affairs. People wandered from gallery to gallery, conversing with friends and lingering to chat in the hall. Patrons at the El Charro Restaurant got a ringside seat on the action and could be seen waving to friends through the bright windows that give them a view of the socializing in the galleries next door. 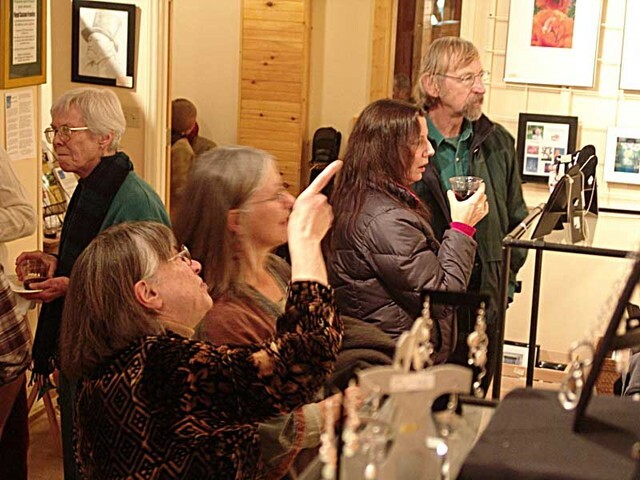 After touring the galleries, some of the visitors visited Sally Walker’ Cafe Del Sol up at street level to sip wine, admire the art and listen to more live music. Others went down to the Over The Moon Cafe where Mike Mitchell gave a remarkable performance featuring some of the tunes from his new CD. He was joined for a few numbers by Dave Fason of Windfall. The acoustics of the new seating arrangement at Over the Moon are excellent. Friday nights in Floyd County, Virginia, are a time for celebrating even in winter because shops are open and South Locust Street in downtown Floyd is busy with dancers and musicians waiting to join in the fun at the Friday Night Jamboree at the Floyd Country Store. This First Friday gallery opening is a charming way to kick off the month. It is a custom that started in late 2007 and is becoming more popular with every passing month. Drop by and join in the fun. 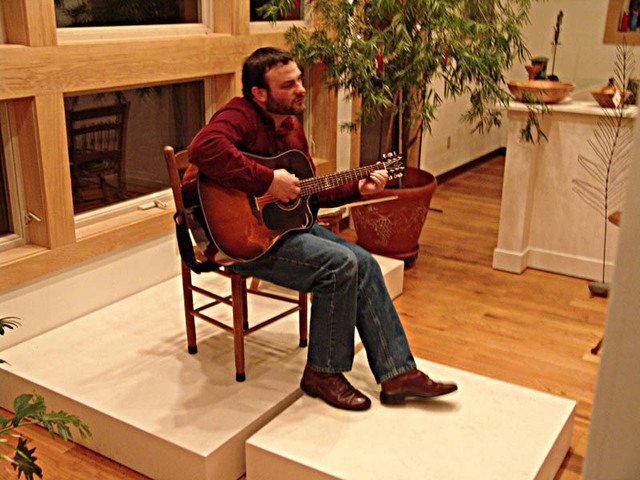 This entry was posted in Country Living and tagged Art Under the Sun, Cafe del Sol, Dave Fason, El Charro, Floyd County, Floyd Virginia, Ironic Dixie Trio, Mike Mitchell, Over the Moon. Bookmark the permalink.